I'll have no truck with those who want to fix the clock and deprive us of the pleasure of the sudden transformation of our evenings. 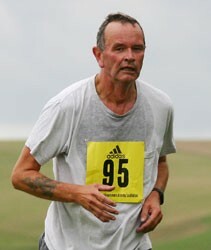 Last night, for the first time since September of last year, I ran with the Seaford Striders over the downs, off-road. No more the long slogs in the dark round our winter route, although thanks to our new unofficial club coach Peter Weeks, those sessions were leavened this winter with interval and hill sessions in varied locations. With the pre-running preliminaries at an absolute minimum - congratulations to members who'd achieved some fine times in the Lewes 10k and a reminder of our track session next Monday - we set off for the countryside, up and over the golf course to Fiveways. At Fiveways, what had seemed until that point to be a small orange blob in the western sky expanded into a massive sunset of great beauty, and we ran back down towards Seaford as the light faded. Later in the year there will be boats in the bay, when the sailing club start their Wednesday evening sailing. It was a run of just under five miles. Later in the year longer runs become possible, out to Bo Peep, into Friston Forest, over to the hills above Bishopstone. For now, this was perfect.